This afternoon experience starts out with a friendly orientation and one-on-one rider training. See all that downtown Austin has to offer on this 90- minute Segway Sightseeing tour of the State Capital of Texas grounds and the Live Music Capitol of the World. Your Segway tour makes its way down Congress Ave with a stop at the only monument (story telling) at Angelia Eberly. From there, your Segway tour-guide will lead you to several picturesque and historic sites in downtown Austin including the charming and haunted Driskill Hotel. After gliding past 6th street’s numerous live music venues, your Segway tour-guide will lead you through the warehouse district (Willie Nelson Blvd), which has grown into a dining and entertainment area downtown, and then to the Moody Theatre, which is home to Austin City Limits with a glimpse of the new library. You’ll see this and much more as you cruise through the capitol of Texas on your Austin Segway tour! 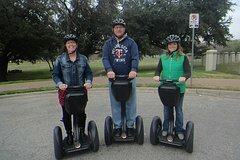 Enjoy seeing the city with Segcity Segway Tours who has conducted thrilling experiences since 2004 in Austin. Experience Austin on a 1-hour sightseeing tour in a way that will be memorable. This Segway experience will take you around downtown to see the State Capitol of Texas, the Driskill Hotel and more without all the historical information to slow you down. This Segway tour does not require any experience, we provide rider training; it’s for families, work groups and couples. You will learn about the history will have a blast on your Segway with the best tour guides in town. Stops are offered at the State Capitol of Texas and The Driskill Hotel.